Knipex Pliers Wrenches might be my favorite tool in my tool chest and my EDC Tool Roll. I say this not only because of how well they work but because of how clever they are. What I mean is, I really like how they work but I love the idea of them too! 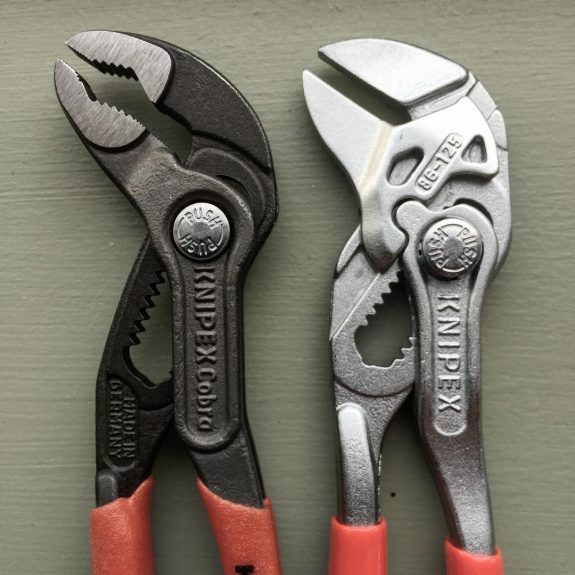 Knipex Pliers Wrench (right) shown with Cobra Pliers (left). If you can imagine adjustable pliers that have been retooled with some engineering magic to have parallel opening jaws, you have the idea of the Pliers Wrench. They open and close like pliers but have the flat, parallel opening jaws of a wrench. The result is a tool that can “ratchet” by simply loosening your grip, has very fine adjustability, lets you easily control the pressure on the fastener with your grip, and can handle much larger fasteners than similarly sized adjustable wrenches. These parallel jaws allow other uses like straightening sheet metal. They can also be used to push in roll pins and work especially well on stubborn pins like the bolt catch roll pin on an AR-15 lower receiver. You just place the Pliers Wrench over the pin and squeeze your grip to push it into place. I own 3 different sizes of the Pliers Wrench but the one I carry daily is the 5″ version (86 03 125). It is the same size as the Knipex Cobra Pliers that I also carry and between the two of them, I can get a lot done. This tool is surprisingly small but it can be adjusted wide enough to turn 7/8″ diameter fasteners. One thing that makes the 5″ version especially well suited to everyday carry or range bag use is how thin the jaws are. The tool itself is extremely stout but the jaws taper to just less than 1/8″ thick at the tips. This makes it easy to get on the smaller nuts and bolts often found on optics mounts or other gear. I purchased my 5″ Knipex Pliers Wrench (86 03 125) at Amazon. I have found the larger sizes locally at places like Sears Hardware but never the 5″ version so I had to purchase online. For a lower priced alternative adjustable wrench that is compact but still handles larger fasteners, check out the Lobster Shorty. We will eventually post some comparisons of a few options in a later installment of The EDC Tool Roll. Do you have a compact adjustable wrench that you prefer? Tell us about it below.